Before I hand over to Kieran for part two of his Value Betting series of articles I just want to mention Racing Dossier. 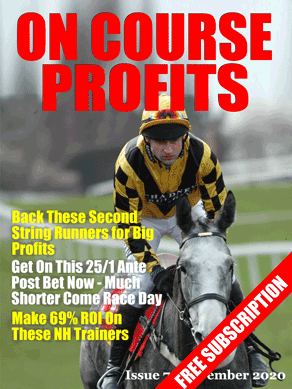 If you downloaded the free Racing Dossier software then today you can get the first system to use with the software. This system made 171 points profit in 2012, 15 points so far in 2013 and has a 29% strike rate. We are betting on a coin toss. There are two possible outcomes of a coin toss: heads comes up or tails comes up. Either of those is equally likely to occur on any one coin toss, therefore the probability for either one is 50%. A probability of 50% expressed in fractional odds is 1/1 or even money. In decimal odds that same probability would be expressed as 2.0. If you were to take those odds about either event occurring in a coin toss, in the long run you would break even, neither making or losing money (though in the short term you could easily come unstuck due to general variance). In other words, at odds of even money you have no edge – and are therefore receiving no value. Even worse than that, a bookmaker would price up either event at 10/11 (1.91) to lock in his profit margin (known as their over-round). Clearly not a course of action we would want to pursue! Much better! The second set were value bets – we were getting a price that exceeded the true probability of the event occurring! We would be very foolish not to avail ourselves of that price, repeatedly and to the largest stakes we could afford (while applying sound money management principles, of course). Unfortunately, we are unlikely to find any bookmaker offering 11/10 about a fixed probability event such as heads coming up in a coin toss. The true probability is fixed and therefore easily calculated. (If anybody ever does find such a bookmaker, please introduce me!). Luckily, this is not the case for all events a punter might want to assess. Tomorrow, I will be looking at some more complex events that are much more difficult for bookmakers to price accurately – and consequently offer us far greater opportunities for finding value! Today we have a guest article from Clive Keeling of What Really Wins Money. If you have something interesting or profitable that you would like to share with readers of the Daily Punt, do send us an email, we are always willing to share winning ideas with our readers. The next time you peruse the football betting coupon, pay close attention to the odds. They can sometimes tell a story and provide ready-made clues as to what the bookmakers (or market-makers at Betfair) expect to occur in a given match. 1.2 in decimal odds equates to 1/5 in fractional odds. Using a recent weekend, here are some examples of Sub 1.2 odds matches and their resultant score lines. In this instance, the odds were close. Dortmund did score 3 goals but their opponents managed a consolation goal. Here the 3 goals minimum was nearly reached, but Olympiakos did keep a clean sheet. Another 2-0 match and another clean sheet. Barcelona scored 3 goals minimum, but did concede a consolation goal. Real Madrid scored 5 goals, and did concede just 1 goal. These odds give you a framework – a guide around which to work. The simplest way to validate the odds is to look at the head-to-heads. I want to show you the head-to-heads of the two teams which won 2-0.
times in the last six head-to-heads. In the last four head-to-heads, Ajax have only managed to score a maximum of 2 goals. Historically, Real Madrid have scored 5-5-3-4-3 against Ath Bilbao. This is very much in keeping with a quote of 1.17 isn’t it? So what do you do to make money from this information? ✓✓ Over 4.5 goals, with one eye on trading. ✓✓ The possibility for a player to score a hat-trick (I would limit myself to teams with world-class strikers such as Van Persie, Messi and Ronaldo). ✓✓ Dutching a correct score. Look to start at 3-0. These correct scores are decently priced, which means you can back up to 3 and still profit. This second set of odds usually results in both teams scoring and a possible tight win. The odds in question in this second example are 1.7 (or 4/5 in fractional odds) for the away team. scoreline. Or a possibility that the home side could win, again by a very, very tight scoreline. You will recall that these were the kinds of odds I used to create my treble bets, which I then layed at Betfair using their multiples. Both sides scored and 1-1 resulted. The odds here just peeked below 1.7. Again, both teams score in this match and Reading only win courtesy of a penalty: another tight match. In this match, both teams scored and the home side won a very tight match indeed. The away odds between 1.7 and just over evens (2.0 decimal) seem to be the ideal odds in which to assume that both sides have a chance of scoring a goal and winning, ideally by 2-1 or 1-2. How can you profit here? away side is always an option. Horse racing layers would be delighted at an ability to lay a horse as low as 1.7–2.00 and have a good chance of success. Why not back both sides to score? Or for you traders, lay the team that scores first? The hope here, of course, is that we reach a 1-1 scoreline rather than a 2-0. And how about those who still play the bookies’ football coupons and the Pools, where score draws are welcome? Incidentally, for those of you interested in the Football Pools, they now have a dedicated website at http://www.footballpools.com. This is something that piques my interest and I’ll be trying to discover some strategies we can use to profit from this new-look Football Pools.